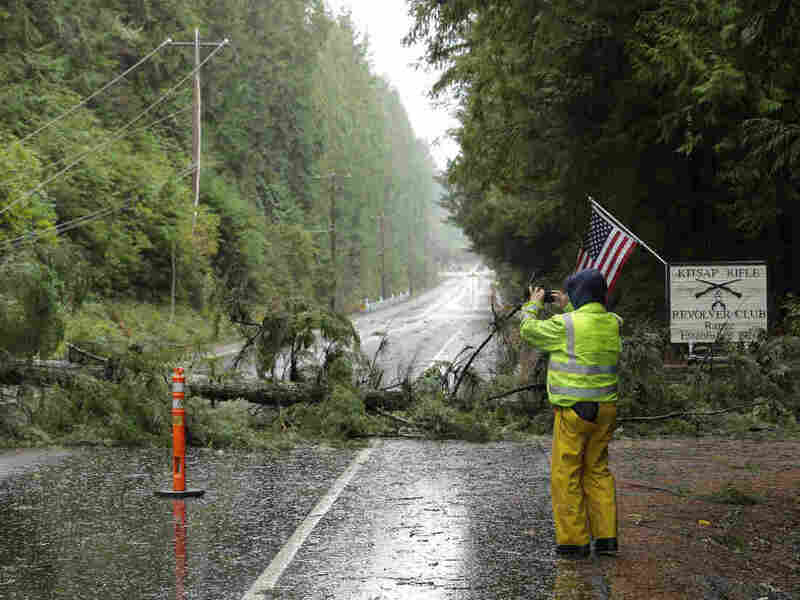 3 Killed By Storm-Felled Trees In Washington State : The Two-Way Utility companies say high winds knocked out power for more than 350,000 people. A number of school districts closed. Swollen rivers blocked roads. A worker photographs a tree that fell on power and fiberoptic lines and blocked a highway in Washington state on Tuesday. At least three people have been killed after a storm struck Washington state and the rest of the Pacific Northwest on Tuesday. Heavy rain and high winds, some of which reportedly reached 100 miles per hour, ravaged the region. All three deaths were caused by falling trees, the Associated Press reports, including a woman in Spokane and another woman who died after a tree landed on her car on a highway south of Spokane. A man died when a tree crushed his car as he was driving in Snohomish County, authorities said. The winds also knocked down power lines, cutting electricity to more than 350,000 people in Washington and Oregon, according to the AP. News reports say more than 100,000 people were still without power on Wednesday. KOMO News in Washington reports that it could take several days to fully restore service. A number of school districts and universities in Washington were closed Wednesday and swollen rivers have blocked roads. According to the National Weather Service, flood warnings were in effect for several areas in Washington. "All night and all morning in the dark, they helped each other to try and save their livestock from the rising river. Many say they didn't expect it to get this high so quickly. "Farmers are loading up every animal they can grab — pigs, horses and cattle. The water is already knee deep in some yards, surrounding homes and barns. "Lane says he has a brand new calf. He was able to get it to a safe place, and he's hoping the rest of his cattle find their way to higher ground because he can't reach them all."